Available now from the Perth Mint of Australia is the 2013 Proof Australian Gold Sovereign Coin. Each is composed of 91.67% pure gold (22-karat). There is a mintage cap in place of only 1,750 coins. This coin marks the fifth annual issue of the series. A new reverse design has been created for this release, though it still honors the classic Sovereigns by portraying elements of the original Type 1 reverse first struck back in 1855. "The discovery of payable gold in the colony of New South Wales in 1851 lay behind the establishment of the Sydney branch of the Royal Mint, which opened on 14 May 1855," states the Perth Mint. "The Sydney Mint produced its first Type I sovereign, featuring a unique ‘colonial’ design, on 23 June. Over 400 million coins were created in Sydney, and at Royal Mint branches opened later in Melbourne and Perth." It is elements of that colonial 1855 Type I sovereign which is honored by the 2013 Proof Australian Gold Sovereign Coin. The reverse portrays St. Edward’s crown along with a laurel wreath and the inscription AUSTRALIA, all taken from the Type I reverse as originally designed by Leonard Charles Wyon. This modern adaptation by Ing Ing Jong also includes the inscriptions of PERTH MINT, SOVEREIGN and the Perth Mint’s historic ‘P’ mintmark. Offered on the obverse is Ian Rank-Broadley’s effigy of Queen Elizabeth II. The portrait of the Queen is surrounded by the inscriptions of ELIZABETH II, AUSTRALIA, 2013 and the legal tender face value of 25 DOLLARS. The legal tender status of the coins is guaranteed under the Australian Currency Act of 1965. Each coin features 0.2354 troy ounces of gold with a minimum gross weight of 7.9881 grams. Maximum diameter of the strikes is 22.60 mm with a maximum thickness of 1.75 mm. The Perth Mint houses each coin in a wooden presentation case. The coin, case and a numbered certificate of authenticity are all included with each purchase along with an illustrated shipper. 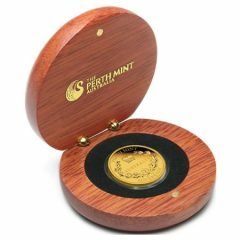 Those interested in purchasing a 2013 Proof Australian Gold Sovereign Coin may do so directly from the Perth Mint of Australia. Initial pricing is listed at AUS $590.91, or US $606.82. Pricing is subject to change based on the market conditions of gold. I understand the numismatic fetish for reproductions of old coin designs, but usually a reproduced design has some merit of its own, whether novelty or beauty. I wonder if this design will appeal to anybody other than the most devoted of Sovereign collectors?